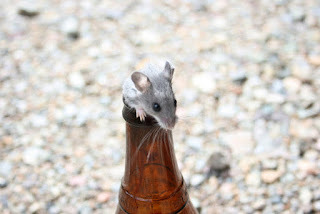 Beervana Buzz: Got a Mouse in Yer Beer, eh? Got a Mouse in Yer Beer, eh? How many times have we heard about someone finding a mouse in a bottle of beer or soda? I always figured the mouse got there one of two ways: Either the victim stuffed the mouse in there in hopes of getting a nice fat settlement check or a disgruntled employee put it there hoping to derail the company. What are you doing in there, eh? It turns out the mouse-in-the-bottle trick isn't a recent angle. People have been putting (finding) meesketeers in bottles for a while now. At least as far back as the 1960s, for sure. 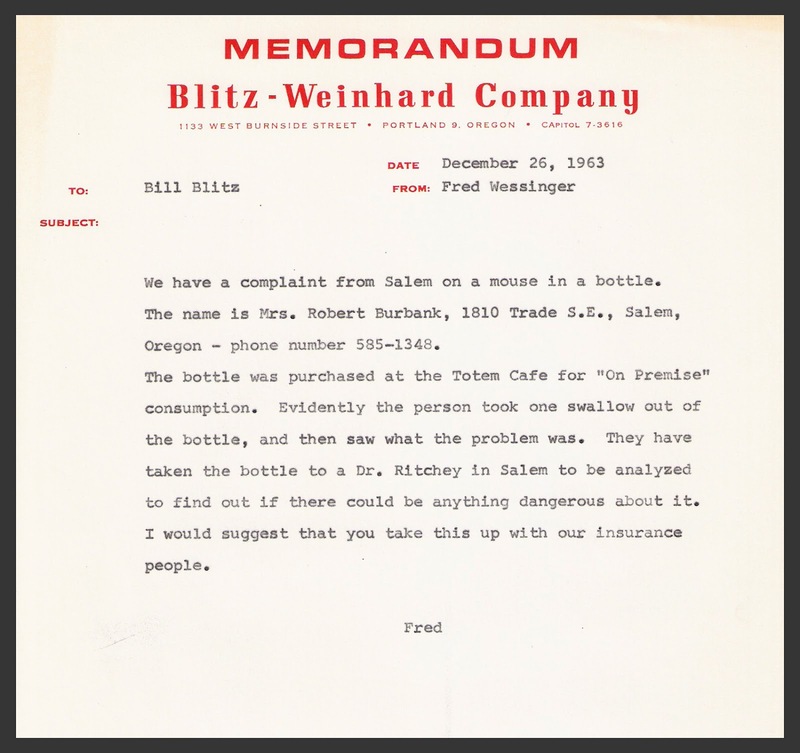 I know because I recently came across an internal Blitz-Weinhard memo from 1963 that deals with a meesketeer in a bottle. I discovered the memo as part of research I'm doing on Portland's beer history. It's either a gem or turd, depending on how you look at it. 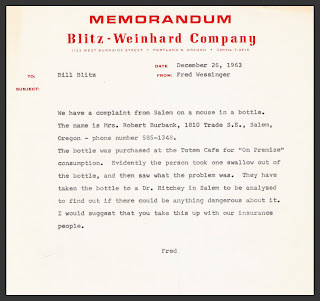 The document outlines a complaint from a woman in Salem who purchased a bottle of Blitz-Weinhard beer for on-premise consumption and, after taking a swig, realized the beer wasn't quite up to snuff. A closer look revealed why...there was a mouse in the bottle! I have no way of knowing what the outcome of this situation was. The document trail ends. Fred Wessinger (then president) advises Bill Blitz to get the insurance people involved, so I assume some kind of settlement was arranged. Perfect. Of course, there are those who see opportunity in this kind of thing. Bob and Doug McKenzie made an entire movie, Strange Brew, based on the premise of getting free beer via mouse-contaminated beer. I haven't seen the film, but there are plenty of shorts on YouTube. The brothers have it all figured out. The trick to getting a mouse in a bottle is kind of like shipbuilding in a bottle. You get a baby mouse and put him in a bottle. Then you feed him in there for a few months and before you know it...ah, you can watch the video, eh?